The Eccles Primary Childrens Outpatient Services Building's Mountainside Cafe, designed by MHTN Architects, is garnering attention for it's sleek design, colorful palette and cheerful ambiance. Read the recent publication from Foodservice Equipment & Supplies Magazine below. Mountainside Café introduces a unique spark of sophistication to culinary creations at this Intermountain Healthcare facility. Booths stand out with their colorful palette of orange, purple and lime green in the front of the dining area. The booths are very useful for meetings, because they have high seat backs, which create a sound barrier. A regional Intermountain Healthcare hospital that serves Utah, Wyoming, Idaho, Montana and Colorado, Primary Children's Hospital (PCH) cares for a patient population in a unique relationship with the University of Utah's School of Medicine. One of 22 hospitals in the Intermountain group, PCH outgrew its ability to service patients efficiently in its existing facility and built the Eccles Primary Outpatient Services Building directly to the west of the hospital. Perched on the Wasatch mountain range amidst the University of Utah campus, the building offers a spectacular western-facing view overlooking the entire Salt Lake valley. "Given that the building would house 600 to 900 staff members, it became obvious that a foodservice operation was necessary so University of Utah medical staff and Intermountain staff wouldn't have to travel across a bridge or busy campus for lunch," says Julie Spelman, MBA, RD, PCH's director of food and nutrition services. "Also, a foodservice operation here would help alleviate the crowds in the main hospital cafeteria, which had also outgrown its capacity. This would also be a perfect place for hospital patient's families and guests." An upscale bistro seemed the ideal concept for the outpatient building. And indeed it is. In its first year, Mountainside Café registered 440 daily transactions Monday through Friday and brought in nearly $500,000. The moment staff and visitors enter the building's front doors, they see Mountainside Café to the right. The dining area blends into the lobby space, featuring the use of natural colors to resemble Utah's blue sky. A light blue patterned wall treatment and wavy, hard surface wall contribute to the cheerful ambiance. "The project team talked often about what would activate the lobby and set the experience for the hospital," says David S. Daining, AIA, LEED AP, NCARB, director of healthcare design at MHTN Architects. "Offering food in the space created a natural gathering point and a source of comfort or a potential reward for brave behavior. The café sets the tone for a positive patient experience with its staff giving warm greetings, encouraging smiles and great service." Arranged in a horseshoe shape, food stations allow customers to navigate easily through the space. Two cashier stations handle the lunch traffic. Daining and his team selected a playful use of terrazzo for the flooring. "The finish will last forever, and the gentle curved shapes support wayfinding, as well as add visual interest," Daining says. Sculpted panels at the walls help bring the outdoors in and create a natural indoor environment. Decals on the glass wall panels that depict life-sized wild animals of Utah support the nature theme. Small, interactive rotating panels encourage children to play in the waiting areas. Overhead lights that look like balloons also contribute to the joyful ambiance. Seating styles include light-colored wooden chairs with white solid-surface tabletops and booths in a colorful palette of orange, purple and lime green in the front of the dining area. "The booths are very useful for meetings, because they have high seat backs that create a sound barrier," Spelman says. "Circular booths help parents who sit on each end to corral their children who like to move around," Daining says. In addition, tall chairs at a bar table facing large windows offer solo diners an opportunity to enjoy the mountains while sampling the café's fare. "All furnishings contain washable surfaces to meet the hospital's strict infection control standards," Daining says. Also during the development stages, the family advisory council expressed a need for children's-height hand-wash stations as well as a way to control restless children waiting for their parents to lift them up to an awaiting sink to wash their hands. "A dual-height hand-wash station was designed that met the need but also provided delight in the space as an imaginary water slide feature," Daining says. When looking back at the project, Spelman says the project team faced very few interior design challenges. "We had the space, funds and equipment budget to help reach our goals," she says. "We did have a bit of confusion on the part of our new patients because they did not know if they could eat here. So our public relations staff helped us place signage in the elevators with a place for the weekly menu." Cooking equipment is an integral part of Mountainside Café, allowing customers to see some of the production while selecting their menu fare. The terrazzo floor’s gentle curved shapes support wayfind and add visual interest. The placement of the cookline and food-themed stations, set in an arched shape, conveys a warm, welcoming ambiance. From the moment they enter the servery, guests can see digital signage with the menu and, from right to left, stations featuring composed salads, exhibition cooking with a grill and pizza oven, a deli/antipasto area and soup. A gelato, juice and coffee bar complete the lineup before the POS station. "The equipment follows the way the line works and is efficient because everyone can get to the pass-through," says Brian Morton, executive chef. "The open kitchen drives efficiency because the chefs can see customer volumes and respond accordingly," Spelman says. "The kitchen is very compact and placement of equipment is perfect." Showcasing healthful food and its preparation is a manifestation of Spelman's career, which has focused primarily on healthcare, and that of Morton, who formerly worked in high-end restaurants and then joined healthcare foodservice to "make a difference in foodservice programs for kids at hospitals and schools." He is one of five chefs serving on Intermountain's LiVe Well initiative, which designs menus implemented system wide. In the servery, one of the major challenges arose after designers completed the bistro drawings. Late in the game, the project team decided to add a soda machine with multiple flavored drinks and an ice machine. "We had to raise the entire ceiling of the kitchen to accommodate the ice machine," Spelman says. "It was done, but our construction company crew had a few extra gray hairs." Staff prepare pizza dough in the mixer and gelato in the machine that both heats and freezes. After products arrive at a main-level dock, staff move them into dry storage, two coolers and a freezer. "At first, deliveries were to come from five stories beneath the bistro and through the building, but we rearranged the flow so that deliveries, which are not on pallets, can come through our first-floor entries at the back of the kitchen," Spelman says. In close proximity to the cooler, freezer and a staff facilities room, staff use a designated area to unpack and wash vegetables and some proteins as needed before moving them along for further preparation. The culinary team uses a food processor, worktables with sinks, 20- and 60-quart food mixers and an overshelf with a double-sided utensil rack to prepare mise en place. Some of the operation's hot food production takes place along a cookline with double-stacked convection ovens for making entrées, vegetables, casseroles; a pair of 30- and 40-gallon tilting kettles for soups and stews and braising menu items such as boneless pork ribs served with hoisin sauce; and a four-burner range for heating sauces and specialty glazes and small-batch sauces. A blast chiller provides staff with quick cooling and peace of mind that products are kept within safety standards. In the back of the kitchen, a range, tilting kettle and skillet and combi ovens allow staff to prepare a wide diversity of menu items. The gelato machine can be seen at the rear.In the middle of the kitchen a small catering section serves the café and the conference center. "Our catering for Primary Children's hospital is quite high, considering our size," Spelman says. "We are in the process of growing and defining how many events will take place in this building and how we will divide our staff and fully utilize this area without adding additional staff." Spelman and her staff will offer a new catering menu with selections from the best of both Primary Children's and the Mountainside Café's menus. Their biggest challenge now is the unfinished section for entry from the third floor. Once this is resolved, Spelman says, many steps will be saved in the transfer of all catering from one end of the campus to another. Behind the front service counter and in view of customers, staff use a conveyor flattop griddle, a range and hearth oven. On the cookline in guests' sightlines, staff use a griddle to cook grilled sandwiches, quesadillas and burgers and use a charbroiler to mark chicken for further continuous production in the back ovens. The line also contains a double panini grill, an induction cooker and a double-stacked combi oven for steaming vegetables, chicken enchilada lasagna and other entrees, and baking french fries on Fridays only. "Controlling food smells was very important because patients may come in after fasting or not feeling well," Daining says. "We did not want the café smells to trigger undesirable events. The conversation began around limiting what foods would be used and prepped in the lobby space. The resolution was to place return air and exhaust ductwork close to the café so that smells would not extend beyond the boundaries of the area." At the front line, Fresh Elements features build-to-order salads with and without meat as well as grab-and-go salads. Staff use a refrigerated unit that holds hotel pans of greens and other ingredients and blows cold air over them to keep ingredients fresh and at the proper temperature. "Customers are on one side, and we are on the other, so even though the salads come with specific ingredients, we can accommodate customer likes and dislikes and change out ingredients if they wish," Morton says. Staff have access to ingredients that sit in a small three-door reach-in that is directly behind the station. "Since implementing the salad program, we see that 15 percent of our customers choose the nonmeat option, and it is rising," Spelman says. "Our grab-and-go salad program is seeing rising sales and interest as well." At the exhibition cooking station, staff prepare hash browns in the morning and specialty sandwiches at lunch on the circular cooktop, which also handles overflow from the flattop griddle. From the charbroiler come 5-ounce, locally sourced, fresh beef burgers cooked to order in addition to chicken for sandwiches. Sandwich varieties include turkey, tuna melts and Reubens. In addition, featured daily menu items such as stewed chicken thighs sit in a two-well, drop-in hot food unit. To make pizza, staff prepare dough in a 60-quart mixer. "We don't need to proof because it requires one rise overnight," Morton says. Staff stretch dough on a stretcher that resembles a tortilla press and assemble ingredients on a prep table next to the oven. Due to the positioning of the table, staff's backs face customers as they make pizzas, but they don't have to turn around to put the pizzas into the hearth oven. "We load from the right where the prep table is and pull out from the left, cut and serve," Morton says. Staff place pies on a heated shelf under heat lamps where they remain for short periods of time. Pizza varieties include cheese and pepperoni for children and a pizza of the day featuring global flavors from India, Thailand and other countries. Gelato made on-site delights customers. After customers gather their salads, sandwiches, pizzas and entrées, they pass by a display case holding many gelato flavors. The gelato-making machine sits a little further back in the kitchen. "This machine is the real thing," Morton says. "We mix it cold until it has the right fat content, batch four quarts at a time and then drop it into a freezer." "The gelato display is a great enticement for the kids who come out of doctors' appointments," Spelman says. "They love the treat itself and the visual stimulation of choosing between 12 flavors. We don't serve many desserts, so the gelato is the main choice for all guests for a sweet at the end of the meal." Also on the way to the cashier, guests see the juicer and espresso/cappuccino machine as well as self-serve coffee near the cashier and POS station. One cash register sits at the end of the line, and two others stand in the middle of the space. "This really helps at lunch when we have more traffic coming through," Morton says. Throughout the operation, to help customers make decisions, paper labels give nutritional information, including calorie counts. When customers finish their meals, they leave trays in a room designated for tray drop-off and recycling. "For sanitation, the dishmachine and sanitation area was placed at the back of the kitchen so customers don't hear the noise in the open-air facility," Spelman says. "The dish area has a door directly into the dining area to facilitate tray pickup." A simple compact pulper connects to the disposal so staff can compost directly from this area. Energy Star–rated equipment is used when available. This subsidized operation attracts very positive responses. "Offering a service to employees and families adds a layer of altruism that is very well received," Spelman says. Foodservice Consultant: Cini-Little, Germantown, Md. 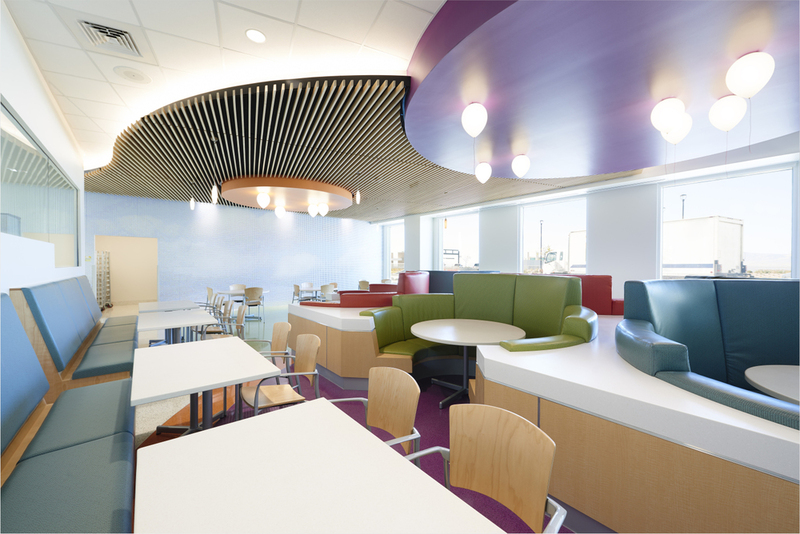 Brightening Foodservice at Eccles Primary Children’s Outpatient Services Building in Salt Lake City, Utah was originally published in Foodservice Equipment & Services Magazine.